Top Posts of 2013: How Long Does It Take to Build a House? With the end of 2013, NAHB’s Eye on Housing would like to take one last look at the updates that attracted the most readers over the last year. In October, we used Census data to examine how long it takes to build a single-family home – our most popular post of the year. A follow-up post examined how long it takes to build multifamily housing. The 2012 Survey of Construction (SOC) from the Census Bureau shows that on average it takes about 7 months from obtaining a building permit to completing a new single-family home. Looking at the houses completed in 2012, houses built for sale, on average, register the shortest time from permits to completion – between 5 and 6 months. Houses built on owner’s land take longer – about 8 months if built by a contractor and more than 11 months if they are owner-built (i.e., where the owner of the land serves as a general contractor). Single-family homes built for rent take, on average, between 8 and 9 months from permits to completion. In most cases, no time is wasted from the moment a permit is obtained and construction is started. Most homes built for sale and on owners’ land are started prior or within the same month as authorization. Houses built for rent, on average, register a slight delay of one month before construction is started. The time from permits to completion varies across the nine Census divisions. New England and Middle Atlantic register longer times of between 9 and 10 months. 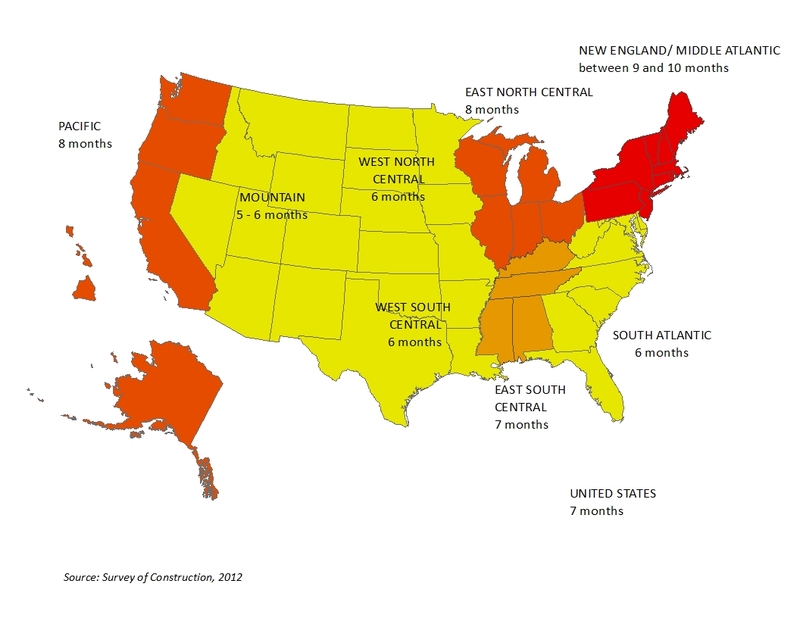 Pacific and East North Central division also show above average time of 8 months to completion. Builders in the East South Central Division manage to complete a home in 7 months, on average. The rest of the country registers times between 5 and 6 months. For houses built for sale, the SOC also gathers information on sales, registered at the time when a buyer signs a sale agreement or makes a deposit on the home, not the final closing. For new single-family homes sold in 2012, the average time from completion to sale is under one month. However, this average is highly skewed by a relatively small number of homes that are not sold prior or while under construction. Looking at new single-family homes completed in 2012, more than three quarters of these properties were sold before or during the completion month, including 30 percent that were pre-sold (i.e., sold before being started). Only 6 percent of homes completed in 2012 remain unsold as of the first quarter of 2013. So, for most new single family homes there is no additional lag from completion to sale.